Why are pre-packaged food products with a Nutrition Facts table, sold or offered directly to consumers, without alteration by the food service operator, exempt from the trans fat regulation? Does a food that says “trans fat free” meet BC’s trans fat restrictions? Should I only buy food with a “trans fat free” claim to be sure I meet the 2% and 5% restrictions? Can I use the “% Daily Value” on the Nutrition Facts table to see if my products meet the 2% and 5% restrictions? What if a food in my establishment does not come with any documentation? What about products imported from the U.S. and other countries? The nutrition information I have for a box of crackers gives me different amounts of trans fat depending on the serving size (e.g. per 2 cracker serving vs. per 100g). What information do I use? Why does some food have a source of industrially produced trans fat in the ingredient list, but the Nutrition Facts table says “0g” of trans fat? The Nutrition Facts table on a product says “Not a significant source of trans fat”, but doesn’t list the exact amount of trans fat. What does this mean and how do I know if the food meets the restrictions? Pre-packaged food with a Nutrition Facts table required under the Food and Drugs Act (Canada) show the amount of trans fat per serving so that consumers can easily identify the amount of trans fats by reading the label and make an informed choice. Yes. A food that says “trans fat free” will meet both the 2% and 5% trans fat restrictions. However, you must also have the ingredient list, Nutrition Facts table or product specification sheet for all food on site to show an Environmental Health Officer that your food meets the restrictions. 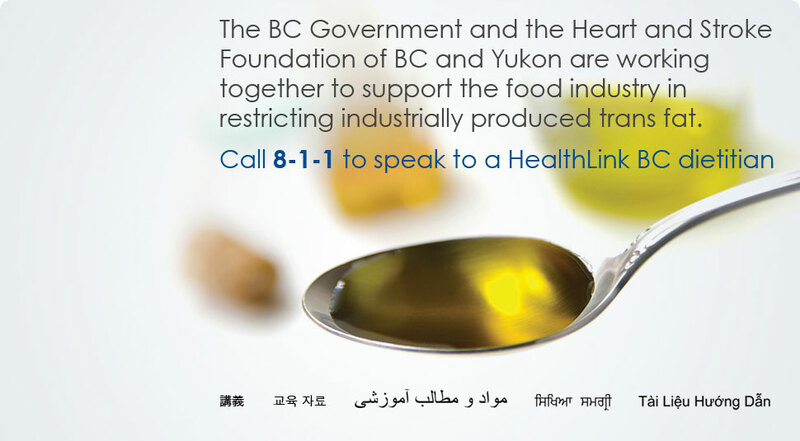 The claim “trans fat free” is a federally regulated claim separate from the BC trans fat regulation. For more information on nutrient content claims, visit the Canadian Food Inspection Agency Website - Nutrient Content Claims..
No. The claim “trans fat free” is not mandatory on labels therefore many foods that are compliant do not carry this claim. Check the ingredient list and Nutrition Fact table to determine which foods are compliant. No. The % Daily Value (DV) is used by the consumer to see whether a food has a little or a lot of a nutrient(s) based on an individual’s daily nutritional requirements. The % DV is not related to the trans fat restrictions. According to federal law, documentation for all food must be available to you as a food service establishment. If a product does not have an ingredient list and Nutrition Facts table on the package itself, ask your supplier for a product specification sheet. For more information visit the Canadian Food Inspection Agency Website - Information Letter - Accompanying Documentation for Nutrition Labelling. A Canadian ingredient list, a Nutrition Facts table, or a product specification sheet is required for all food imported into Canada. Ask your supplier for documentation. Use the information given on a per serving basis, as this represent the amount typically consumed. The food contains a very small amount of industrially produced trans fat, so the amount is rounded to zero. The Nutrition Facts table on a product says “Not a significant source of trans fat”, but doesn’t list the exact amount of trans fat. What does this mean and how do I know if the food meets the restrictions?? Products that state “Not a significant source of trans fat…” should be treated as having 0g of trans fat, and therefore compliant with the trans fat restrictions. This format is a simplified Nutrition Facts Table, and is an acceptable form of documentation. No further documentation is required.